in action. For your little princess, you can find bright Disney classics and dainty images. The best part is that you need absolutely no tools to apply the decals, too. The kitchen is the hub of family life. It’s where coffee is made, homework is done, laundry is folded and art projects come alive. My sister’s kitchen is a bright, sunny space with vintage features. That’s where I started. I ordered a set of the cutest chalkboard stickers shaped like kitchen items, one for each day of the week, chalkboard jar labels and a set of charts showing food-safe cooking temperatures and common measurement conversions. The kitchen conversions and meat temperature charts found the ir place on the back-splash across the stove. Since they’re made of quality vinyl, it’s a snap to wipe any grease or splattered sauce stains off of them. These were the easiest of all to apply. I first hung them next to each other, gently pressing only at the top corners of the sheets. After adjusting them to make them level, I used a ruler I borrowed from the kids’ art supplies to press against the sheet, sliding down. This helped minimize air bubbles. My sister has big old fashioned glass jars with metal lids for storing some of her baking supplies. The chalkboard stickers made them look like they belonged on the shelf of an old western general store or French country kitchen. The set included enough for me to play with in case something went horribly wrong (What could go wrong?) I marked a few with a chalk marker, removed the vinyl around the decals so it would be easier to remove them from the backing and stuck them onto the front of the jars. It really was that easy and instantly cute. I didn’t have to do anything else! Mooooooooooom? What’s for dinner tonight? We all get that, don’t we? Now there’s a whimsical menu wall that showcases a favorite dish for each night. Not only does it silence the inquiring minds who want to know, it also helps you plan your weeknight meals. The kids can help map out the week’s game plan. The decals wipe clean with a damp paper towel and are ready for the new menu. You can maximize your time better, planning your week ahead of time. Once you’ve decided what you’re going to cook, you can get all your shopping done on the weekend and maybe even squeeze a relaxing candlelit bubble bath with a box of chocolates into your busy schedule! Remove the background around the decals and, leaving the backing intact, cut around each one, like pieces of a puzzle. Figure out your target wall. Wherever you decide to display them will generate some foot traffic. That is something to consider,especially in a busy room like the kitchen. If your dining room style is casual or rustic, these decals will look very charming on a wall there. The kitchen nook/breakfast area is another great place for them. The location and size of the wall are important. Next, decide the order in which you want to arrange your decals. I opted for a Monday start, reading left to right, spanning three lines. Before you remove each decal from the backing and stick it to the wall, use scotch tape to apply them to temporary locations on the wall. Once sure you are happy with the arrangement, remove the backing and put each decal into place. Use a standard chalk or chalk pen to write the dish for each day. Most importantly, have fun! Decorate your signs with drawings some cute mushrooms, campfires, designs. Sometimes restlessness settles in and I’m ready for a change of scenery. The best cure is a getaway, but we can’t take a trip at the drop of a hat. That’s when my evil twin emerges and starts rearranging furniture. It does make our home feel new, somehow, but also makes my husband nuts. That and my hiding the electrical outlets behind furniture, etc. (They’re unsightly and he already knows where they are.) The other option is to paint. It is an inexpensive way to give any space a fresh look, but no one has time for that. Several months ago, my friend Janine of Happy Happy Nester told me she had slapped crisp grey and white stripes onto the walls of her niece’s otherwise-boring kitchen. When I saw the photo of the cute new room, I was so impressed with her painting skills, but she told me it was just temporary wallpaper. I didn’t know the stuff existed. Fathead has amazing murals to cover the entire room! Princesses, superheroes, sports icons, you name it. They can even take a photograph you have and turn it into a custom wall decal with special effects that make it look like it was painted by hand. My mind was bursting with ideas. I wanted to see what a photo of Daisy would look like as a watercolor painting. That night, I dreamt I was standing on top of a ladder (even though I’m not too fond of heights), struggling to press out the air bubbles in my poorly applied wallpaper which then proceeded to peel off the wall and wrap itself over me like a straight jacket! I came crashing down, wallpaper and all, straight onto the counter. Luckily, a big chocolate cake broke my fall. (Hey, this is my nightmare.) The headlines in the morning newspaper would read “Woman Escapes Death Hanging Wallpaper.” I think I’ll stick with decals. Now, instead of moving furniture around (breaking my back) changing the layout of the rooms (driving my husband crazy), I get wall decals to not only make things fresh and beautiful, but also apply function to a vertical space. My sister is thrilled with her cute new kitchen. I was pleased I had something more special than perfume, shoes or a handbag to offer my sister for Mother’s Day. These stickers are not only cute, but they make sense, they have a purpose. Flathead inspires the interior decorator in all of us. The choices are dizzying. You can even do something personal with a custom vinyl. I took a photo of Daisy and got one made to look like it was painted with water colors. It came out beautifully! I’ve been playing around with ideas on using it and am thinking it would be best on the door to her room. I’ll get you a photo of that as soon as I’ve got it done. Oh my goodness, your project came out perfect! 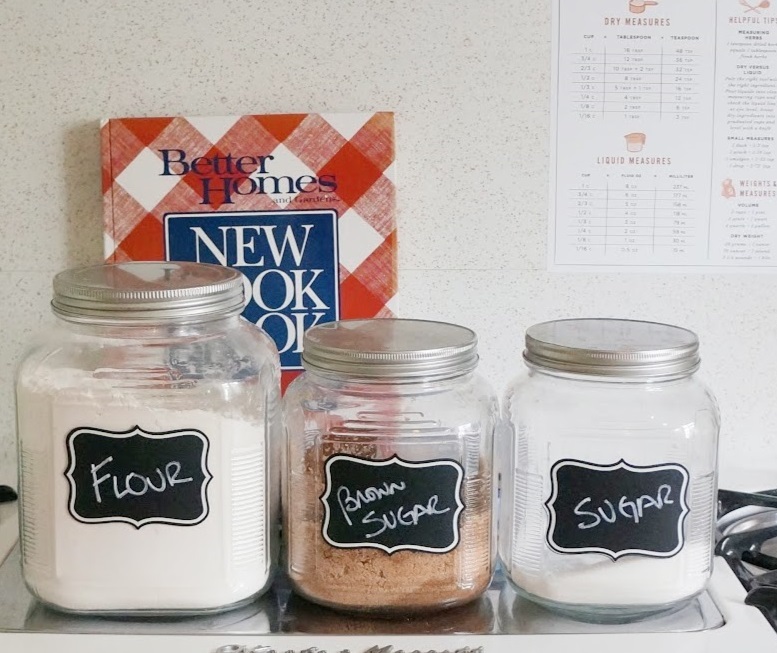 Love the wall of chalkboard decals and also the jar labels! Love the post! Too cute, right? I’m a sucker for chalkboardy stuff. It looks so old fashioned!